The Greenbrae Surgery Center is located at 575 Sir Francis Drake Boulevard, between the Bon Air Shopping Center and Marin General Hospital. Sir Francis Drake Boulevard is a divided road, one way each side. 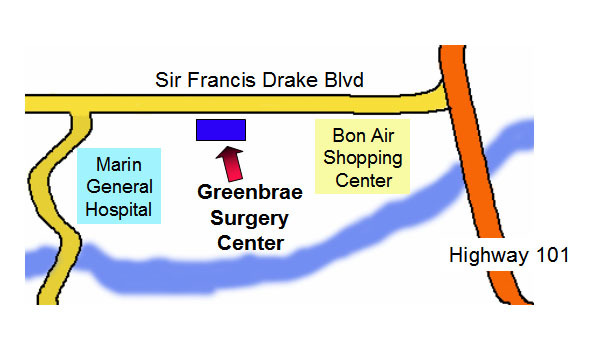 To get the the Greenbrae Surgery Center from Highway 101, pass the Bon Air Shopping Center. The next light is El Portal, make a U-turn at the light at El Portal. The building in front is the Tamalpais Bank. Turn into the parking lot at the bank. The Surgery Center is in the back (see the dotted red line below). The Greenbrae Surgery Center's mission is to allow me to provide quality, cost-effective out-patient surgery in comfortable, safe surroundings. As a part owner of the Surgery Center, I am able to control the quality of care, from beginning to end, just as I do in my office. I feel that I can provide you a level of personal hand surgery care that you cannot find anywhere else. If you feel that there is anything that I can do to provide you with better, more personalized service, please let me know. I am very interested in your input.